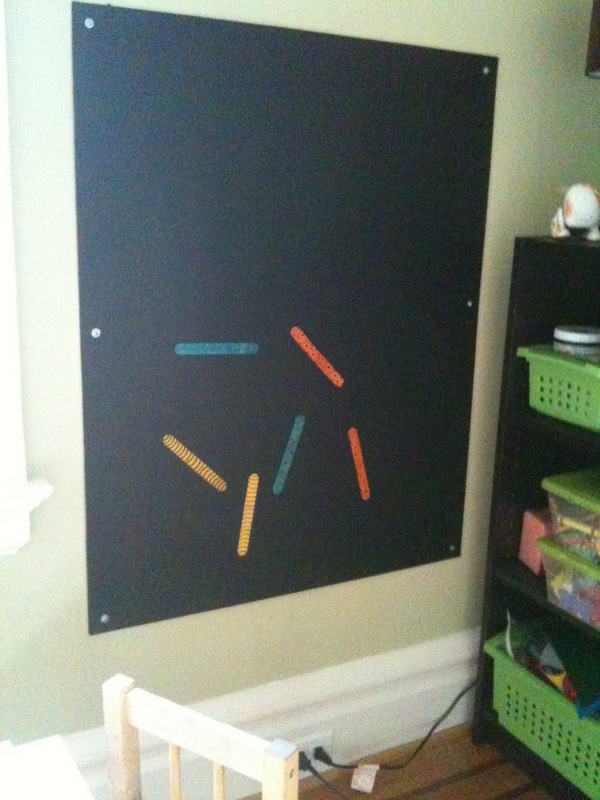 Lately we have been all about magnets, mostly because we have been all about our new magnet chalkboard. Originally this was a leftover back from a Ikea Billy bookcase that has been hanging around our house for a while. I took the large piece of wood and gave it three coats of magnetic paint and three coats of chalkboard paint, both of which I bought at the Home Depot. I had never used the magnetic paint before and was amazed when it actually worked, although there is definitely some magnets that work better then others. I am not sure if that would have been better if I had used more layers of magnetic paint or if that is always the case. However, most of the magnets we have put on it have worked great. To test it out we made some fun popsicle stick magnets. 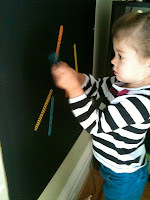 We started by choosing some colored popsicle sticks and drawing patterns on them using black sharpie marker. I made two of each color/pattern, so we could play some matching games with them. I then stuck small pieces of magnet tape on the back of each end of the stick. 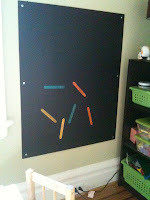 The Bee and Bean have found lots of uses for these magnets matching them up, making trains, lines and suns with them. The magnet board is hanging on the wall in our office/art room and has been a great activity for The Bean when The Bee and I are working on a project that she is not quiet ready for yet.